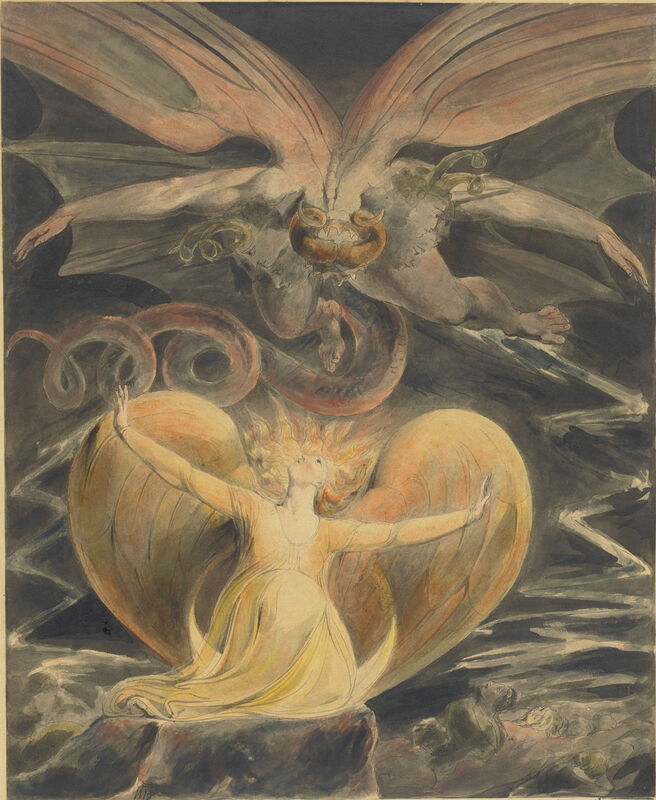 We tend to think that William Blake’s most visionary and radical art was created later in his career, particularly as part of his illustrations to Dante, and that his biblical paintings around 1800 were more conservative. 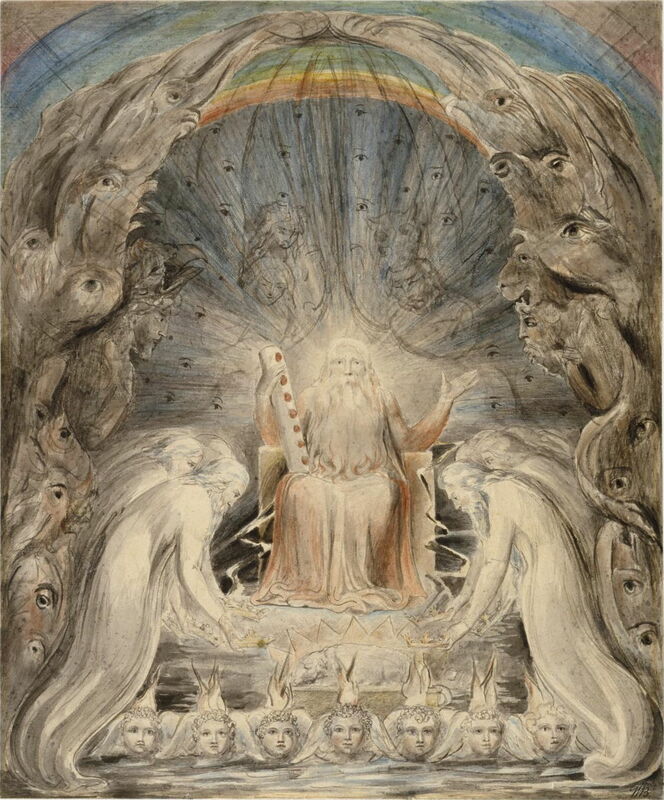 In fact, several of his wildest images were put onto paper for his loyal patron Thomas Butts, as part of Blake’s illustrations to the Bible shortly after 1800. This article examines those, Blake’s extraordinary watercolour paintings of the book of Revelation between about 1800 and 1809. I have already noted that the rainbow is reversed, the ‘whirlwind’ effects, and the multiple eyes, in this quite literal depiction of the Bible. Following this is the painting of Death on a Pale Horse (c 1800) in the Fitzwilliam Museum, Cambridge, England, which I do not show, although it refers to Revelation chapter 6 verse 8. 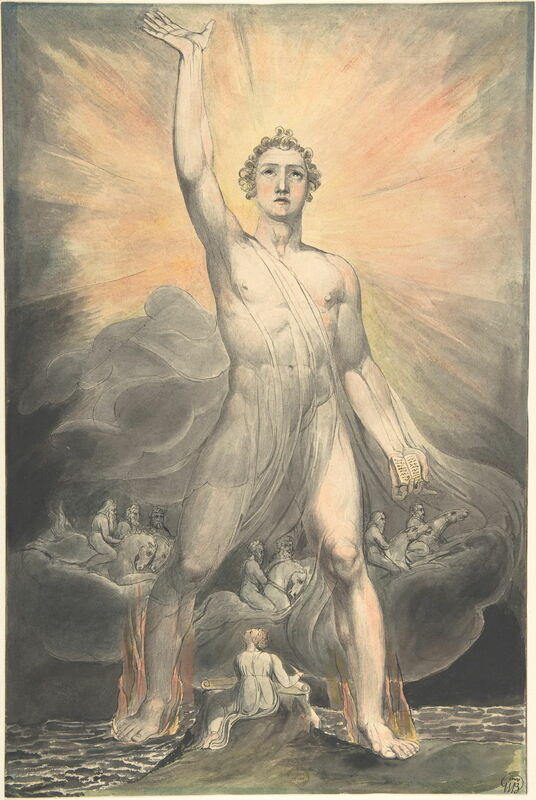 William Blake (1757–1827), Angel of the Revelation (Book of Revelation, chapter 10) (c 1803-05), watercolor, pen and black ink, over traces of graphite on paper, 39.2 × 26 cm, The Metropolitan Museum of Art (Rogers Fund, 1914), New York, NY. Courtesy of The Metropolitan Museum of Art. And I saw another mighty angel come down from heaven, clothed with a cloud: and a rainbow was upon his head, and his face was as it were the sun, and his feet as pillars of fire: And he had in his hand a little book open: and he set his right foot upon the sea, and his left foot on the earth, and cried with a loud voice, as when a lion roareth: and when he had cried, seven thunders uttered their voices. And there appeared a great wonder in heaven; a woman clothed with the sun, and the moon under her feet, and upon her head a crown of twelve stars: And she being with child cried, travailing in birth, and pained to be delivered. And there appeared another wonder in heaven; and behold a great red dragon, having seven heads and ten horns, and seven crowns upon his heads. And his tail drew the third part of the stars of heaven, and did cast them to the earth: and the dragon stood before the woman which was ready to be delivered, for to devour her child as soon as it was born. This is one of Blake’s best-known visionary images, a unique chimeral beast with body parts drawn from human, dragon, and caprine sources. 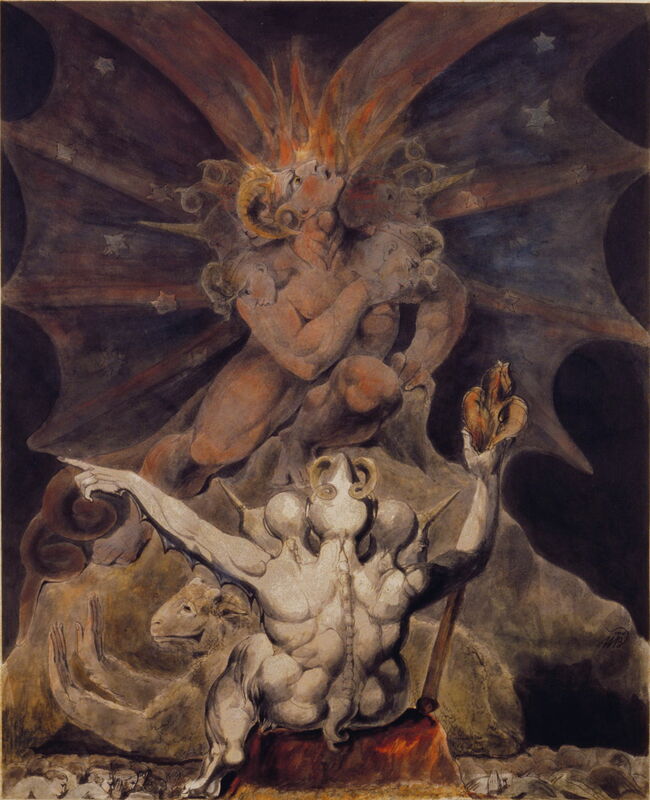 William Blake (1757–1827), The Great Red Dragon and the Woman Clothed with the Sun (c 1805), pen and gray ink with watercolor over graphite on paper, 40.8 x 33.7 cm, The National Gallery of Art (Rosenwald Collection), Washington, DC. Courtesy of The National Gallery of Art. Therefore rejoice, ye heavens, and ye that dwell in them. Woe to the inhabiters of the earth and of the sea! for the devil is come down unto you, having great wrath, because he knoweth that he hath but a short time. And when the dragon saw that he was cast unto the earth, he persecuted the woman which brought forth the man child. And to the woman were given two wings of a great eagle, that she might fly into the wilderness, into her place, where she is nourished for a time, and times, and half a time, from the face of the serpent. The narrative proximity with the previous painting and the next two make these four works almost a graphic story in themselves, as might be seen in a modern graphic novel, for example. 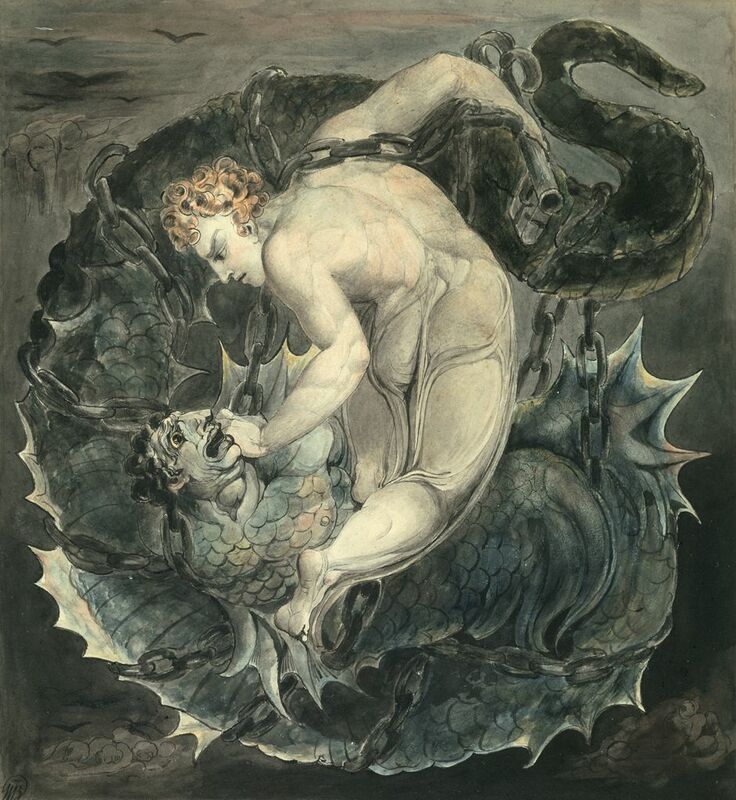 William Blake (1757–1827), The Great Red Dragon and the Beast from the Sea (c 1805), pen and ink with watercolor over graphite on paper, 40.1 x 35.6 cm, The National Gallery of Art (Rosenwald Collection), Washington, DC. Courtesy of The National Gallery of Art. 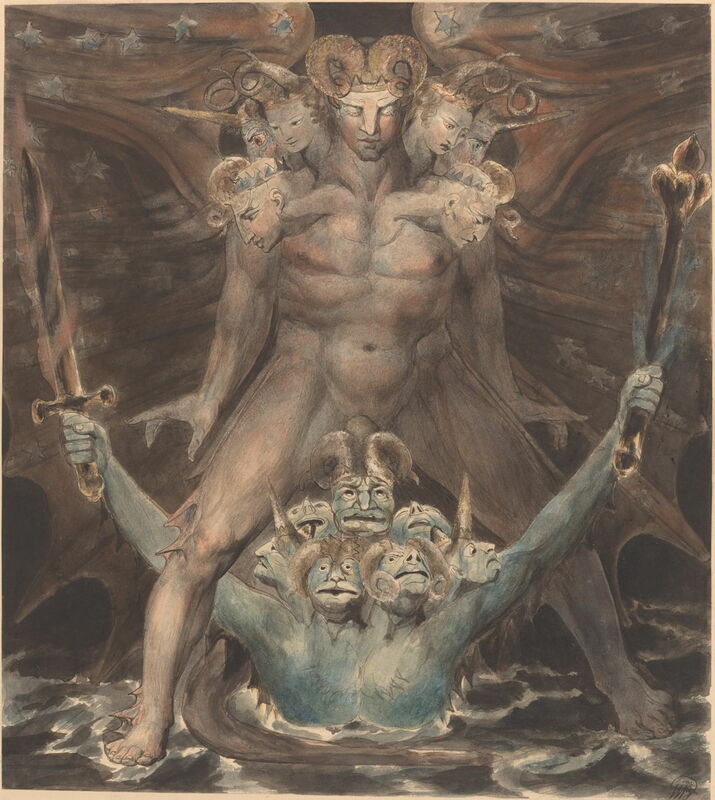 William Blake (1757–1827), The Number of the Beast is 666 (c 1805), pen and watercolour on paper, 41.2 x 33.5 cm, Rosenbach Museum and Library, Philadelphia, PA. Wikimedia Commons. 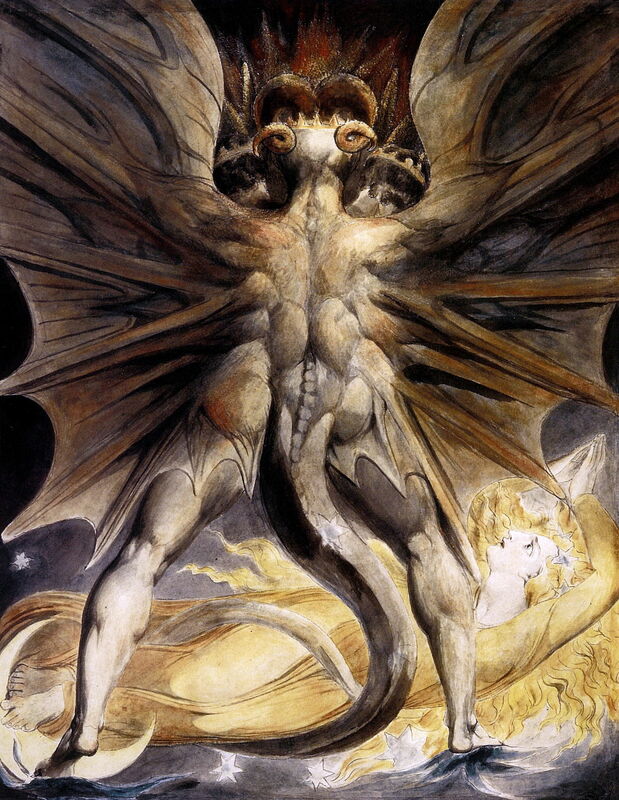 This completes the sequence of four paintings sometimes known as Blake’s Great Red Dragon series. 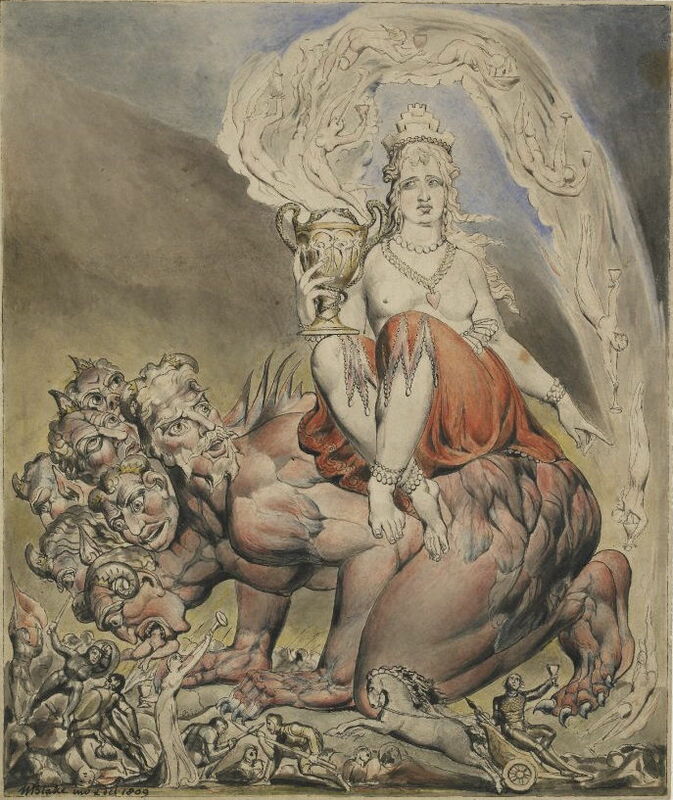 William Blake (1757–1827), The Whore of Babylon (1809), pen and black ink and watercolour on paper, 26.6 x 22.3 cm, The British Museum, London. Courtesy of and © Trustees of the British Museum. Sadly, Blake’s purple has been lost as a result of fading. The abominations and filthiness of the whore’s cup flow out in a stream of naked miniature figures, which fall down to the ground by her. The full sequence then concludes with The River of Life (c 1805), which refers to Revelation chapter 22 verses 1-2. The book of Revelation, with its vivid and phantasmagoric scenes of the apocalypse, has always been a fertile story for an artist’s imagination. But I know of no series of paintings which compares with Blake’s in its masterly, closely-detailed, and very literal account. It inspired some of Blake’s most outstanding and visionary works of art, which even now have not been matched. Posted in General, Painting and tagged apocalypse, Blake, painting, Red Dragon, Revelation. Bookmark the permalink. Where is macOS Sierra 10.12.2?